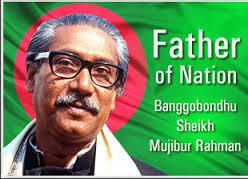 The Father of the Nation Bangabandhu Sheikh Mujibur Rahman (1920-1975) is the architect of independent Bangladesh.Born on 17 March 1920 in the village Tungipara under the Sub-division (currently district) in the district of Faridpur, Sheikh MujiburRahman’s father, Sheikh Lutfar Rahman, was a serestadar in the civil court of Gopalganj. Sheikh Mujibur Rahman passed his matriculation from Gopalganj Missionary School in 1942, IA (Twelfth Grade) from Islamia College, Calcutta in 1944 and BA from the same College in 1947. In 1946, Mujib was elected general secretary of the Islamia College Students Union. He was an activist of the Bengal Provincial Muslim League and a member of the All-India Muslim League Council from 1943 onwards. Sheikh Mujib’s active political career began with his election to one of the posts of joint secretaries of the East Pakistan Awami Muslim League (1949). As a political prisoner, he was then interned in Faridpur jail. In 1953, Sheikh Mujib was elected general secretary of the East Pakistan Awami Muslim League, a post that he held until 1966 when he became president of the party. Like his political mentor huseynshaheedsuhrawardy , Mujib also underscored the importance of party organisation and management. To organise the party, he resigned from the Cabinet of ataurrahman khan (1956-58) and devoted himself to the task of taking the party to grassroots level. A charismatic organiser, Sheikh Mujib had established his firm control over the party. He had the mettle to revive the Awami League in spite of the fact that his political guru, HS Suhrawardy, was in favour of keeping political parties defunct and work under the political amalgam called National Democratic Front. Disturbed by the radical political views of Sheikh Mujib, the Ayub regime put him behind bars. A sedition case, known as agartala conspiracy case , was brought against him. It may be noted that during most of the period of the Ayub regime Mujib was in jail, first from 1958 to 1961 and then from 1966 to early 1969. 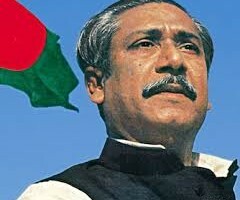 During the second term in jail, Mujib’s charisma grew so much that a mass uprising took place in his favour in early 1969 and Ayub administration was compelled to release him on 22 February 1969 unconditionally. 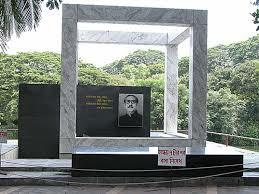 On the following day of his release, the SarbadaliyaChhatraSangramParishad (All Parties Students Action Committee) organised a mass reception to him at ramna racecourse (now, SuhrawardyUddyan) and accorded him the title ‘Bangabandhu’ (Friend of the Bengalis). In him they saw a true leader who suffered jail terms for about twelve years during the 23 years of Pakistani rule. Twelve years in jail and ten years under close surveillance, Pakistan, to Sheikh Mujib, indeed proved to be more a prison than a free homeland. Meanwhile, General Yahya Khan and other leaders from West Pakistan came to Dhaka on 15 March to start a dialogue with the Bangabandhu and his party. The dialogue began on the following day and continued intermittently down to 25 March morning. During the period, non-cooperation and hartals continued unremittingly in East Pakistan. Students and leaders of various political parties had been declaring independence from March 2 and the spree continued. Against this backdrop, at mid-night of 25 March 1971, the Pakistan army launched its brutal crackdown in different areas of Dhaka city including the University of Dhaka killing students, teachers and innocent people in the name of operation searchlight. Thus a nine-month long genocidal killing was unleashed by the Pakistan occupation army. Bangabandhu Sheikh Mujibur Rahman was arrested on the night of 25 March and was kept confined at Dhaka Cantonment until he was taken to West Pakistan for facing trial for ‘sedition’ and inciting insurrection. Before his arrest Bangabandhu sent a wireless message to Chittagong over the ex-EPR transmitter for transmission declaring the INDEPENDENCE OF BANGLADESH. 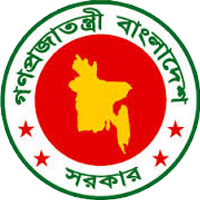 Although during the war of liberation was begun in the wake of the 25 March army crackdown Bangabandhu had been a prisoner in the hands of Pakistan, he was made, in absentia, the President of the provisional government, called the mujibnagar government , formed on 10 April 1971 by the people’s representatives to head the Liberation War. He was also made the Supreme Commander of the Armed Forces. Throughout the period of the War of Liberation, Sheikh Mujib’s charisma worked as the source of national unity and strength. 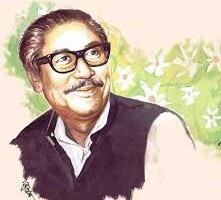 After the liberation of Bangladesh on 16 December 1971 from Pakistani occupation, Sheikh Mujibur Rahman was released from Pakistan jail and via London he arrived in Dhaka on 10 January 1972.